Part of the appeal of flagships is that they get all the best components. In the camera department, this means a large sensor, a high-quality lens with an extra-wide aperture, powerful LEDs for the flash, and an OIS module if it can fit. The Huawei Nexus 6P brings a 1/2.3" sensor, which is on par with what point-and-shoot cameras have. And it only spreads 12 million pixels on it, making the individual pixels quite large, 1.55µm. It has an aperture of f/2.0 and no OIS. By comparison, the LG V10 has the widest aperture among the three - f/1.8 - so it lets more light in than the Nexus lens. However, there are more pixels squeezed on a smaller sensor footprint - 16MP on 1/2.6" makes for a 1.12µm individual pixel size. 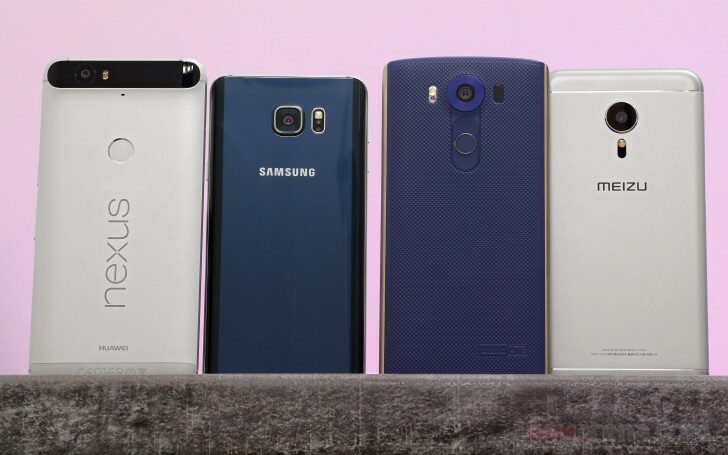 The Samsung Galaxy Note5 is smack in the middle in between the two with a f/1.9 aperture lens and a 16MP 1/2.6" sensor.